The trik bicycle is a real transportation alternative.the battery tricycle comes with the strongest motor,750 watt and the largest capacity batteries. Trike bicycles using high-quality large-capacity lead-acid traction batteries, power strong; using high quality DC motor, low noise operation and long service life; speed control system with variable speed, simple structure and easy operation. 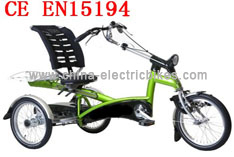 Electric tricycle, small size, flexibility to walk through the narrow road between. Electric tricycle with a reversing switch, you can easily achieve the reverse drive functions, and has voice prompts, which in the narrow roads of the alley, the alley is very useful, both with parking are very convenient. Electric tricycle during operation no pollution, help protect the environment, you can charge at night when electricity trough full use of power resources, eco-friendly social benefits. Charging electric tricycle, drive system is designed using high-quality components that significantly reduce operating costs, the average operating cost is far lower than the same car. Electric tricycle relatively new, is a good way for sightseeing. And the price is cheap.